Various platforms that Cat's Eye Technologies has worked on. Note that the precise distinctions between a Tool, a Platform, and a Library are debatable, and entries may be categorized somewhat arbitrarily. The Cat's Eye Technologies Platform is a NetBSD-based, shelf-powered, Funicular-built "distro" containing almost all of Cat's Eye Technologies' software distributions. Note that the distribution does not contain a built version of this implementation; the distribution contains Funicular configurations which allow you to build this disk image from source. It currently builds for the IBM PC compatible architecture, but in theory it could be built for other architectures that NetBSD runs on. A pre-built disk image is available to download via this torrent. 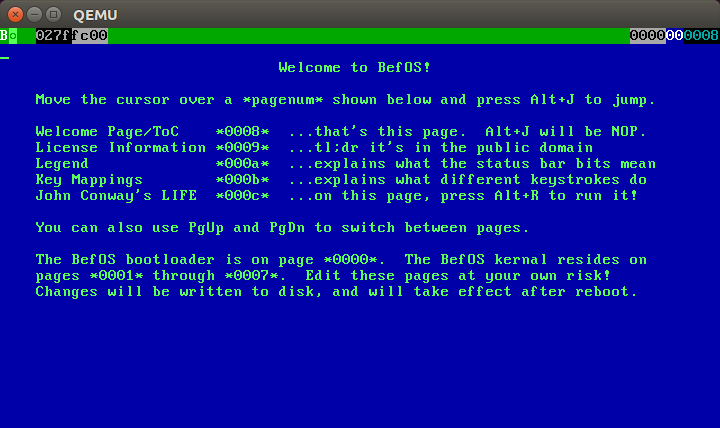 Begun in the late 90's as a project to write an "operating system" in the theme of Befunge-93, BefOS is a program for the IBM PC compatible architecture which boots off of a floppy disk and presents the user with a 2-dimensional, text-console-based interface to the computer system. However, it omits most of the functionality of a production operating system, and most of the functionality of Befunge as well, and therefore might be more accurately described as a disk sector editor with some unusual features. It has an article on the esowiki here: BefOS.